Three friends went to Beijing for Chinese New Year. One of them couldn’t wait to find exotic textiles and antiques at the markets; another dreamed of seeing the Forbidden City, the Temple of Heaven, Tiananmen Square and other remnants of Mao’s Red China; The third came along with the others because she wanted to get away and she always had her eye on those lovely jade bangles that hung so delicately on the wrists of Chinese girls.They were so green and pretty, she had to have one. The first girl found a cheap bangle at a stall in Xidan. Its was a thick, streaky aqua coloured band. It sounded like glass when it banged against anything but it was beautiful. She wore it a few times and lost interest in her jade souvenir. The second girl went to a jade wholesale store above the Bejiing Silk Markets- she already had a pair of fine jade earrings a dear friend had bought in Singapore and was looking for quality jewellery. She was told by the seller “$300 good value for you, Missy! Yes? Very cheap. Can keep this one until dead long long time. Jade is lucky, Missy – good qi, you know qi? Wear it on left hand, close to heart. Good for health.” Her friends helped her to haggle over one of the higher-end bangles for 45 minutes. Eventually she got it for 60% less than the asking price, thanks to their competent negotiating skills. This bangle was a translucent, cloudy green and was the most lustrous of the three bangles. It chimed like crystal when it was struck against another piece of jade. She planned to give this bangle to her mother. The third girl got a fairly good quality yet reasonably priced bangle from the Hongqiao Pearl Markets.It was a little more than she, being a student, intended to spend. She loved everything about it: the bright peppermint with swirls of pale minty green, the way it fit so closely to her wrist, the red silk packaging, the heaviness…it was like a big green Lifesaver. What a great buy it was – worth every yuan. Other two friends noticed how much she wore her bracelet and, in fact, she did seem much happier. Perhaps she was luckier since she bought it! 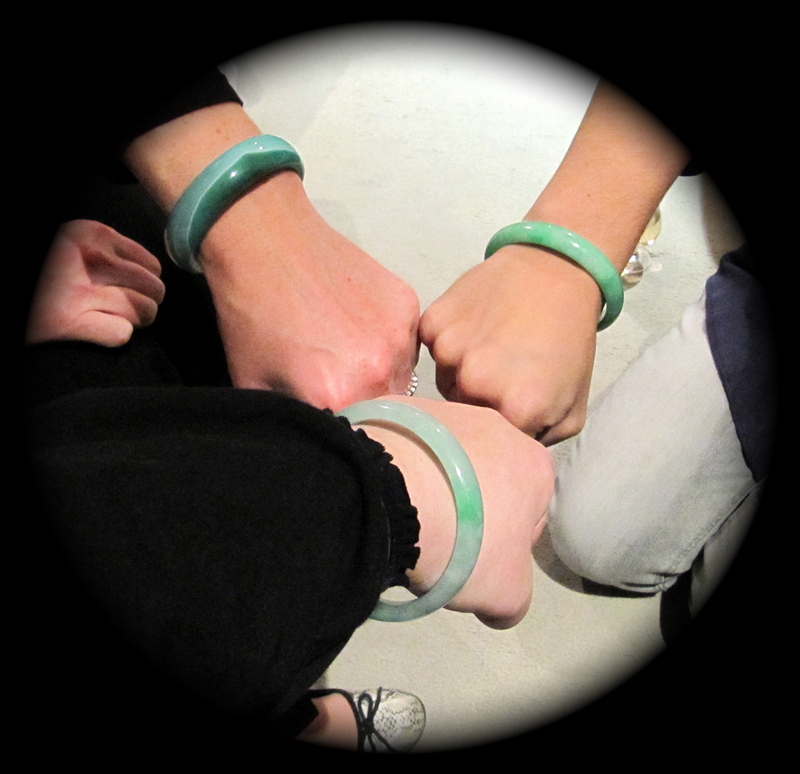 Maybe it did improve her qi – so they all started wearing the shiny, cool green stone around their wrists.Even all these years later, the friends still wear their jade bangles.